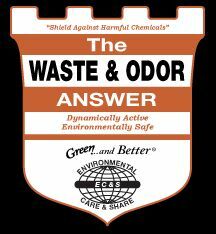 It is a dehydrated concentration of a proprietary formula to facilitate the rapid decomposition and remediation of waste and waste odors. USE DIRECTIONS: Hydrate & activate before application. HYDRATE: Slowly stir entire contents into 50 L (13.21 US gal) of non-chlorinated water until completely blended. ACTIVATE: Let mixture rest in cool place with lid loose for 48 hours before application. LIQUID WASTE: 3.79 L (1 US gal) of Activated product treats approximately 4934 m3 (4 ac.ft.) of Liquid Waste. SOLID WASTE: 3.79 L (1 US gal) of Activated product treats approximately 4934 m3 (4 ac.ft.) of Solid Waste. ODOR: 3.79 L (1 US gal) of Activated product treats approximately 0.372 ha (40,000 sq.ft.) of area. APPLICATION METHODS: Mist, spray, or pour Activated product onto treatment area as required for most effective coverage and to facilitate rapid composting and odor remediation. May be applied as often as needed. Discuss with you technical adviser.